The thirty-two Piano Sonatas of Ludwig van Beethoven form one of the most important segments of piano literature. 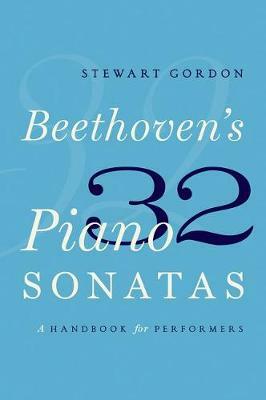 In this accessible, compact, and comprehensive guidebook, renowned performer and pedagogue Stewart Gordon presents the pianist with historical insights and practical instructional tools for interpreting the pieces.In the opening chapters of Beethoven's 32 Piano Sonatas, Gordon illuminates the essential historical context behind common performance problems, discussing Beethoven's own pianos and how they relate to compositional style and demands in the pieces, and addressing textual issues, performance practices, and nuances of the composer's manuscript inscriptions. In outlining patterns of structure, sonority, keyboard technique, and emotional meaning evident across Beethoven's compositional development, Gordon provides important background and technical information key to understanding his works in context. Part II of the book presents each sonata in an outline-chart format, giving the student and teacher ready access to essential information, interpretive choices, and technical challenges in the individual works, measure by measure, all in one handy reference source. In consideration of the broad diversity of today's Beethoven interpreters, Gordon avoids one-size-fits-all solutions or giving undue weight to his own tastes and preferences. Instead, he puts the choices in the hands of the performers, enabling them to create their own personal relationship with the music and a more powerful performance.